Thanks to his uncle, who shared his knowledge of the history of art with him from an early age, Jean-François Costa, father of the current directors, was impassioned by objets d’art throughout his life. His museum tours and discussions with experts, curators, historians and simple art lovers, forged his taste for antiques and, in particular, for the French 18th century. A pioneer in his field, Jean-François Costa began collecting perfumery objets d’art in the Fifties, before perfume met with its current popularity. 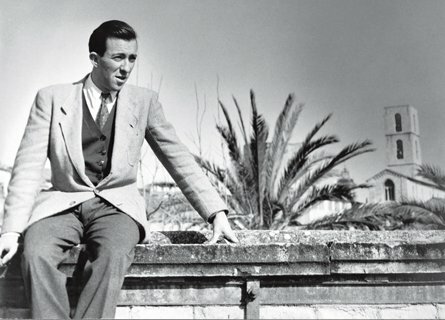 His collection, which started out as a professional interest, soon became unique. 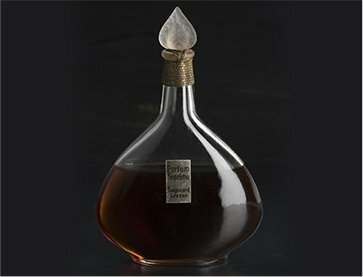 It features distillation equipment and objets d’art dating from Antiquity to the mid-20th century and is the only one of its kind in the world in terms of quality, quantity and variety. Trained by their father – and just as passionate about perfume – Agnès and Françoise continue to perpetuate his work and enrich the museum collections regularly with new acquisitions. Discover the history of perfume through six must-see objects on show at the museum. 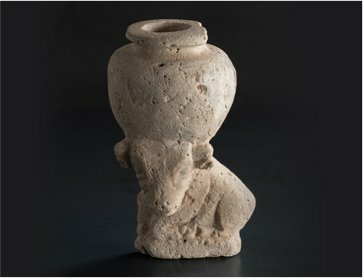 One of the oldest items in the collection, this Mesopotamian kohl vase represents a bovine. An exceptional object, it stands witness to an era when perfume was not only used for religious regions, but also as a beauty product. Red Lekythos representing a woman draped in a long chiton. She is framed by a decorative meandros. The base of the neck is decorated with palm leaves. Worn on the belt, as a pendant, or carried in the hand, pomanders or smelling boxes were used to repel disease and epidemics, widespread in the Middle Ages. Used in solid form, the perfume was placed in the various compartments of this silver-gilt pomander, made in the late 16th century. Manufacturers became more widespread during the Renaissance period, and the perfume bottle became a genuine item of jewelry, crafted with various rare materials and gems. 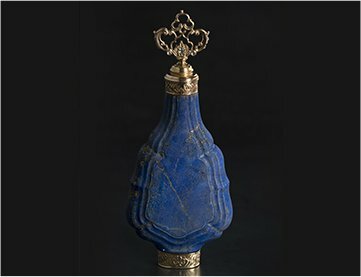 Made of lapis lazuli, this bottle is decorated with gold interlacing and adorned with diamonds. Germany, circa 1700. Under Louis XIV’s reign, the aristocracy and bourgeoisie raved about perfume products in every shape and form. 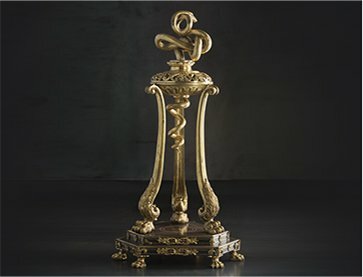 Artists put their talent into creating outstanding objects such as this astonishing perfume burner made of gilded bronze and ebony and adorned with scrolls, crossed by the twisted body of a snake. Perfume bottle created by the Russian jeweler Karl Fabergé, famed for his Easter eggs set with precious gems, commissioned by the Tsar for his wife. 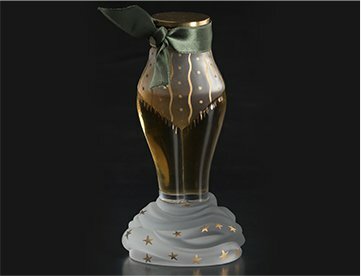 This bottle is made of smoked quartz mounted with gold and adorned with diamonds and sapphires. 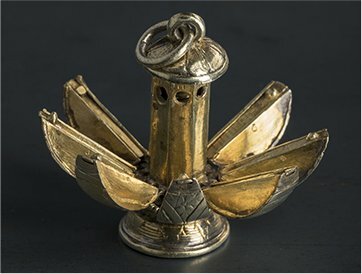 Astonishing and unusual, perfume bottles are found in every shape and form through the ages. Guttus of Alexandrian origin in the shape of a foot wearing a gladiator sandal, with a filtering strainer. 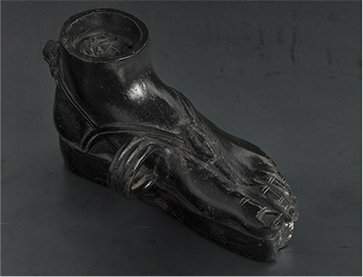 It features an orifice decorated with a lion’s head above the heel, pierced with 5 filling holes at the ankle set around the molded figure of a man’s head. 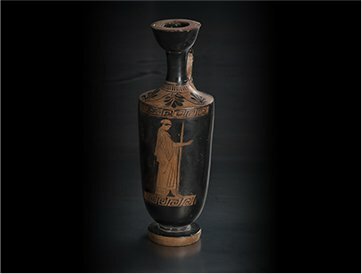 This vase was probably used as a recipient for funeral unguent, as indicated by the inscription engraved on its front. The shape appears to be inspired by Hellenistic Greek prototypes but it is of typical Etruscan fabrication. 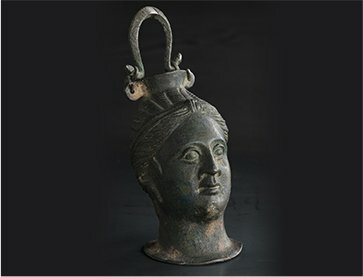 It was made in 3 BC, probably at the workshops of Orvieto or Vulci, then famed for their bronzes, in bronze with a dark green patina. 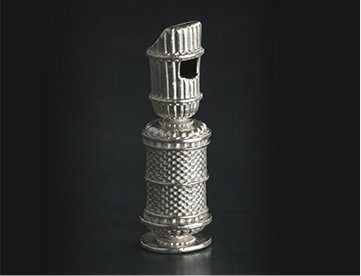 Baluster-shaped whistle pomander in silver guilloche. 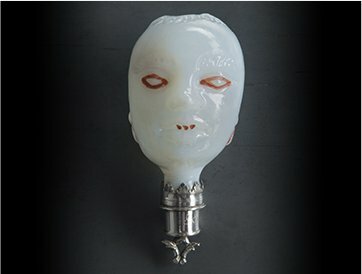 Bottle in the shape of a Roman man’s head in milky opal glass embellished with red for the eyes, ears and teeth. Attributed to the Bernard Perrot factory (Orléans), it may also be the work of the Nevers factory or Saint-Quirin glass factory. 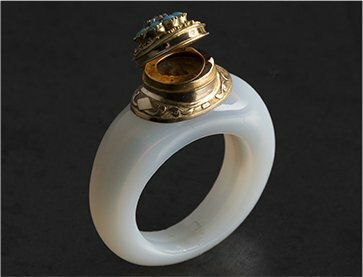 Ring flask in opaque white glass (opal) featuring a mount forming a repoussé and chiseled gold cabochon on a guilloché base adorned with turquoise and a central, rose-cut diamond. 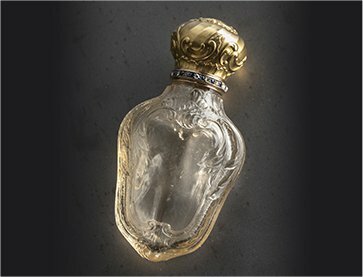 The upper part of the cabochon comprises a hinged cap, through which the perfume was poured. Attributed to the workshop of F. Egermann. 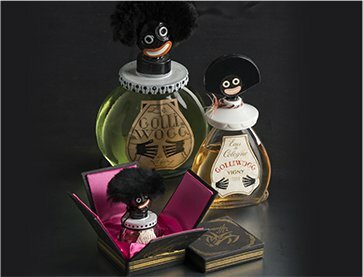 Presented in a cubic carboard case sheathed in black paper with a golden motif and fuchsia satin interior, this African-style bottle is made of clear glass adorned with black and white enamel. It portrays the first colored person featured in American comic books written by the Upton sisters. His fur-topped head acts as a stopper. Designed by Michel De Brunhoff. The profession was revolutionized in the 20th century by a trio comprising a perfumer, a glassmaker and a fashion designer. 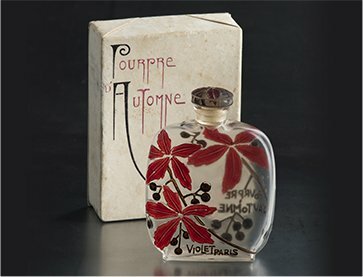 Bottle of Pourpre d’Automne perfume by Violet, from 1923. It is presented in its rare, rectangular cubic case sheathed in paper and titled in red and black. The bottle is clear glass, the body an inrô shape. Each decorated side is molded and lacquered with red and black fruit and chestnut leaves. It features a carnette neck and cabochon stopper with the same lacquered decoration. The case and bottle were designed by Lucien Gaillard. 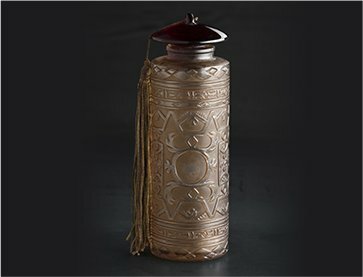 Rare, pressed and molded clear glass cylindrical bottle in the shape of a roller, molded with Chinese bistre patina motifs, with a disc-shaped convex stopper in ruby red tinted glass adorned with lace. Designed for the International Decorative Arts Exhibition in Paris. 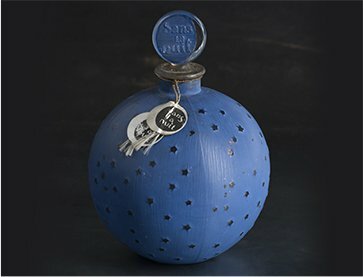 Blue, ball-shaped glass bottle dotted with stars. Designed by René Lalique for the perfume by the haute couture house Worth. 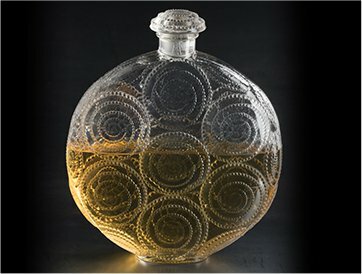 Bottle designed by the famous early 20th-century master glassmaker René Lalique for Fragonard’s Suprême perfume. Designed by René Lalique for Maison Forvil, the Relief bottle is a large, pressed and molded clear glass bottle of cylindrical oval shape. The body is in the shape of a rounded, convex disc, with a molded pearly arabesque decoration in relief. The carnette neck and cabochon stopper are similarly decorated. Numbered and signed model. Partially frosted glass bottle with a golden and tin decoration.